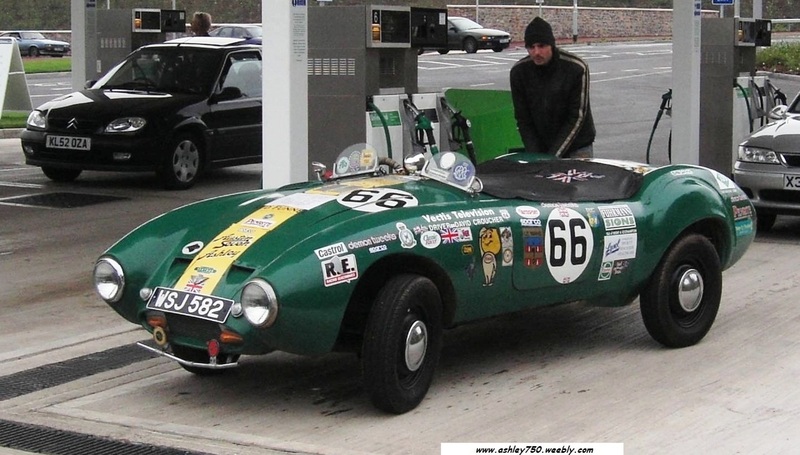 This Ashley 750 is displayed in the Club Car Photo Gallery on the Fairthorpe Sports Car Club website, it is designated as being formerly owned by Torsten Beierl, (a club member maybe). From the sign on the wing of the car it is driven by David Croucher, (could this be the guy filling the petrol tank, or another maybe). As can be seen from the DVLA information above the car has not been licensed in UK since 2006, maybe it was sold into Europe (hence the reference to Torsten Beierl being the former owner). I happen to know a bit about this car, as my father knew it’s builder David Croucher, via the Vectis Historic Vehicle Society, based on the Isle of Wight. I saw the car twice, initially as a Bodyshell, and later (in 1998 or 99) as the finished car. The Bodyshell was interesting, in that it had GRP rear wheel arches, and the doors were hinged from the front. I have no idea if either of these were original, or later additions. David fitted the body to a Reliant Kitten chassis, and lengthened it between the doors and rear wheel arches to fit. I believe David did a lot of travelling around with it, he may even have taken it over to the USA for a road trip, but I cannot be sure, he has obviously sold the car on. Armed with the information David gave me regards the Ashley's builder, David Croucher, being a member of the Vectis Historic Vehicle Society based on the Isle of Wight, I sent them an email asking for their help, they in turn emailed Vectis Television which is the Isle of Wight TV as they had a sponsors sticker on David's car. This was a very good move on their part as it was received by Alan Philpott an old friend of David Croucher, he replied and his message sent on to me. Alan's message confirms the USA road tour mentioned in the above email I received from David and also the building of the car. me to publish it here on the website. and scan them for me when he finds them. However he has a large storage area and has not found them yet. It's been a while now so guess Alan has had trouble finding them. Sold in December 2004 on ebay. There is also note on the DVLA data indicating that it has now been exported. ​Making another Ashley lost to the EU. As I would like to have more information about the car and if possible make contact with the owner.